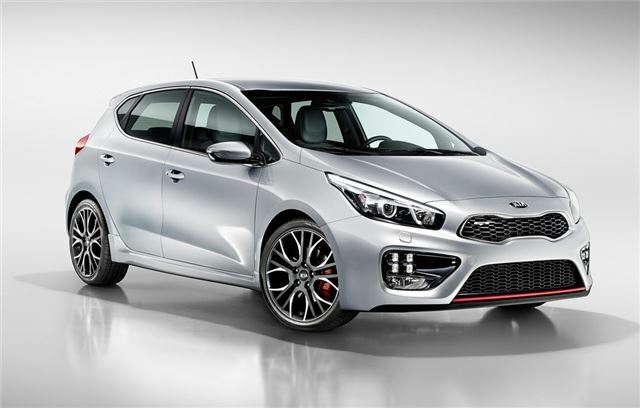 Kia has revealed details of the new performance GT versions of its Cee'd and Pro_Cee'd hatchbacks. Set to go on sale in mid 2013 there are no details on prices yet but we do know that the GT models will be powered by the same 1.6-litre turbocharged engine that's used in the Veloster Turbo with power boosted to 204PS and 265Nm of torque. That's not far off the outgoing Volkswagen Golf GTI and gives the Cee'd and Pro_Cee'd GT models a 0-62mph time of 7.9 seconds. Both gets a six-speed manual gearbox as standard along with changes to the chassis and suspension. Although there are no actual photographs yet, just the sketches above and below, we do know that the GT models will have different grills, lights, deeper bumpers and their own paint finished. 18-inch alloy wheels will come as standard along with painted red brake calipers. There will also be LED daytime running lights while inside the GT gets Recaro sports seats and alloy pedals.